You are here: Home / Archive Contents / Preacher On The Run! I have never written an article for Truth Magazine before. I’ve never thought that I was good enough to do so with my limited ability as a writer. I’ve been a member of the Lord’s church and fellow laborer with God in the preaching and teaching of the gospel of Christ for 30 years. Truth Magazine has been a blessing for me over the years. For 30 years I have preached and taught the gospel in the area that I presently live. I have been a member of a small congregation for 18 years. 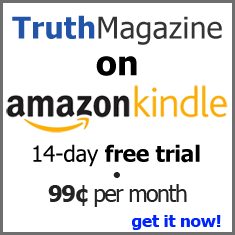 Truth Magazine has been an excellent aid and tool for me in learning the will of God. Of course an open Bible has been the final say so on religious matters. It is a sad thing though when brethren will not even read a religious paper such as Truth Magazine because I believe they can’t take the truth on certain of their pet sins. I guess they have not read 2 Timothy 2:2 lately. They seem to read everything else. Recently in Truth Magazine I read brother Fultz’s article dated July 16, 1998 on “Quarreling Brethren.” That particular article mirrored my experience as a teacher and preacher of the gospel. The wide range of issues he struggled with in his early years were also a time of confusion for me. But through reading Truth Magazine and checking the Scriptures, line upon line and precept upon precept, I came to see those issues fall into place and for me were resolved. I don’t mind to say at this point, faithful brethren such as Foy E. Wallace, Jr. and Roy E. Cogdill and all the writers of Truth Magazine played an important part in my resolving these issues. Brethren, over the years I have taught what I thought and understood to be the truth on such issues as divorce and remarriage, dancing, wearing of shorts, social drinking, mixed swimming, long hair on men, etc. I’ve taught what faithful writers in God’s word over the years have taught concerning such matters, solely for the purpose of saving souls. So today fundamental gospel obedience and such like are what people want to hear. Tell me what I need to be doing and not what I am not supposed to be doing is the cry heard today. Yes, I am discouraged, disheartened, disenchanted, and, it seems, alone when it comes to members of the Lord’s church caring whether or not a brother is cast out and cold shouldered because of this kind of preaching. Brethren, use all the tact you want, or the compassion and kindness and harmlessness as a dove you may — it won’t be enough to prevent the appearing of some brethren through some tactical means of low, underhanded dealing to say in essence, “smile,” you are on your way out and we will have peace and happiness here in the church with one who will just preach the gospel. Of course he will just preach the gospel, but in order to keep his job he will mention not one of the aforementioned sins. Well surely they will let some old buzzard preach every once in a while? No they won’t either. Brethren, you try and change the minds of members of the church today on these subjects! The ones that run the church will not, and just not a few preachers will have enough courage and honesty to teach the truth for fear of losing a job. Maybe it’s time to start all over and build another church for those preaching the gospel (????). I can still “make tents” and support my family, but a real present danger is confronting me daily as I try to be a Christian and preach the gospel (Matt. 28:18-20). I find myself a preacher on the run and nowhere to go. The answer cannot be to just remain silent as a tomb as some do and watch souls slide the slippery slope to hell! Although frustrated enough, like Jeremiah the prophet, I contemplate doing so. These few words are written in hopes my brethren who write for Truth Magazine might encourage me to stand fast and from “such to turn away” that won’t listen to the whole counsel of God. Brethren, keep writing articles, but I hope while you are doing so that you are saying the same things to those who are Christians that are there at the church where you preach and teach. From a preacher on the run!